Ghosts walk the roads of modern San Juan Island in “Departure”, the latest outing by local author Anne L. Watson. The novella — part ghost story, part historical novel, part fable — features Henry, a worker of the Roche Harbor Lime & Cement Company, and Charlotte, the young daughter of a Friday Harbor merchant, as they search for clues to how they died and why they haven’t been taken off. Along the way, they try to understand the curious changes in Island life and customs in the time since they lived. Departure weaves island lore, human insight, and spiritual wisdom into a magical tale of redemption and fulfillment. Ask for it at your favorite bookstore, or buy it on Kindle. 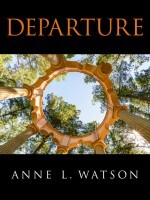 For more information on Anne and her books, visit www.annelwatson.com.